However, I was exposed to topology (oh! those bubbles and spheres! ), imaginary numbers and game-playing machines much earlier than most. As much as I shied away from the sciences most of my life, I am grateful for the exposure. I learned early about Euclid and Napier (who was, in fact, not a shepherd), and plowed my way through Gödel, Escher and Bach at much too early an age. only a theoretical exercise, not an actual live-animal experiment (I think! 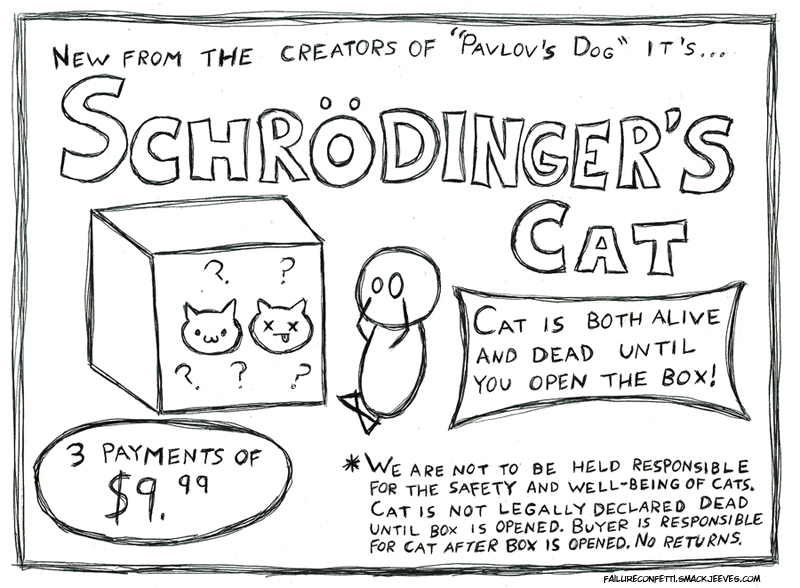 ), as a way to illustrate the Uncertainty Principle and the related Observer Effect. Both of these arise from quantum physics, and point out the disambiguation that something can exist in two simultaneous states, and/or change states as a result of the act of being observed. Given the fluidity of our Learning Age, when instructional designers and trainers secure content, chunk it to be easily understood and applied, and deliver it back via e-learning or synchronous training, I would argue that very act changes the state of the content, and certainly the context in which it resides. Yes, cleaving content from application and setting it up as received knowledge certainly changes the way we see it. And, the way we apply it. The cat may die under our manipulation. The content is either useful or not, applicable or not, advantageous or not. But once we pick it up, process it, and deliver it, it may not be the same as when we found it. The very act of training removes content from its “natural habitat,” unnaturally elevates certain things over others that in actual application may be just as useful, and creates an altered perception of the very same content – a kind of Observer Effect. This is not to suggest that there is no place for training, e-learning programs and learner engagement initiatives. In fact, I rather like my job! It is a call to be thoughtful, conscientious and limited in the approaches we use. Keep learning as close to the machine as possible, to borrow a concept from computer programmers. Remove learning activities as little as possible from the tasks that people perform. Needless elaboration and unnecessary barriers placed in a way that separates learning from the work, rather than making learning a part of the work, should be used sparingly and purposefully. Mathematicians speak of an elegant proof, with as little elaboration as possible. In similar fashion, we necessarily curate content for our learners, but we need to be aware as to the effect that has and limit distortions. As I’ve discussed before, learning practitioners should embed learning activities into the work (aka, performance support), and reciprocally direct work activities and social connections into training activities and eLearning courses. If not, we run the danger of creating altered perceptions in our learners’ minds: “Oh yeah, that’s the training way, but in the real world…” Yes, as soon as we observe it as something other than what it is (our work! ), we evaluate and apply the content differently, too. P.S. Yes, I love Calvin and Hobbes, and am aware of the alive-dead dynamic. P.P.S. I hope to see you at #DevLearn2014! I’ll be talking about this topic and related ideas in Concurrent Session 609. ← Quality, efficiency or efficacy? Hmmm … I’ll take all three!